The Academy has made changes to its rules and policies to try to increase diversity in its membership, which is overwhelmingly white, male, and old. I think this is great. I also think it’s not going to make much difference in future nominations. Will Smith in “Concussion” – The big problem here is that this movie was released late and didn’t send out screeners widely. I was having dinner with a group of screenwriters a couple days before the nominations and the conversation turned to award season movies, as it tends to do in such groups this time of year. Someone brought up “Concussion” and not one person had seen it (and before you accuse us of bias in our viewing choices, almost everyone had seen “Straight Outta Compton”). There are a lot of movies to see this time of year and many voters are still very busy working professionals. If the studios don’t make it easy to see the movies, they don’t get seen (“Selma” had this problem last year). It’s also worth noting that neither the white writer-director nor any of the white supporting cast nor any of the crew got nominations for "Concussion." And Smith has been nominated twice before, so the Academy is clearly willing to nominate him – when they’ve seen and liked his performance. “Straight Outta Compton” – This is a different case because it was widely seen and widely liked. And it looks bad that the only nomination was for the screenplay, which was written by white writers (it may be worth noting that nominations are voted on by the individual branches, so the people selecting screenplay nominees are completely different than the people selecting acting nominees). However, this is an ensemble film and it's difficult for ensemble films to get acting awards. “Spotlight” is one of the Best Picture favorites and its only acting nom is for the sole female character – all of its incredibly talented cast of male actors got nothing. The other ensemble Best Picture nominee, “The Big Short,” also only had one acting nomination. Samuel L. Jackson for “Hateful Eight” – This, too, is an ensemble movie. Yes, Jennifer Jason Leigh was nominated, but she had the only major female role in a large male cast. This looks an awful lot like “Spotlight” – too many good male performances to choose from for the movie’s fans in the Academy. And Jackson has also been nominated before, so it’s hard to make the case he was snubbed because of race. Idris Elba in “Beasts of No Nation” – This one’s tricky. On the one hand, it made less than $100,000 at the box office, so it might not have been seen by many voters. (Of course it was also available on Netflix, but Netflix doesn’t release viewing figures, so we don't know how many people saw it there.) On the other hand, Idris Elba got a SAG nomination, so he was hardly under the radar. The subject matter is a hard sell, and there may also have been a resistance to nominate a movie that was widely seen as non-theatrical. It’s worth noting the film was not nominated in any other category either. Let's call this a possible snub. Michael B. Jordan in “Creed” – This would certainly be a potential snub. The movie was widely seen and liked and Sylvester Stallone got nominated. But the film got few other nominations, suggesting it was considered a good movie, not a great movie. So maybe a case could be made that if the Academy was more diverse, Michael B. Jordan or Idris Elba might have gotten nominated. I still have my doubts. White actors Robert Redford, Michael Keaton, Tom Hanks, Mark Rylance, Mark Ruffalo, Liev Schreiber, Bradley Cooper, Johnny Depp, Michael Caine, Michael Shannon, Paul Dano, Kurt Russell, Tim Roth, Jake Gyllenhal, Nick Nolte, and Ryan Gosling all did excellent performances in well regarded movies and were not nominated. Five nominations are not many, so plenty of worthy performances get left out every year. The preferential balloting system also complicates any discussion of who “deserved” to get nominated. If I’m right that racial bias didn’t play much role in the alleged snubs, it means all of the changes the Academy is making in response to this crisis will do nothing to solve the problem that the nominees do not reflect the diversity of America. But if the problem is not with the Academy voters, where is it? It’s with the people who greenlight movies. The Academy can only nominate performances from movies that get made. In my list of white actors who didn’t get nominations, I could have included Emily Blunt, Lily Tomlin, and Helen Mirren, but they aren’t competing for the same awards as the allegedly snubbed actors. There are no actresses of color that people are claiming were snubbed. That’s because there were no major roles in prestige films for actresses of color this year. There will be more diverse nominees when there is more diversity in casting in prestige movies. The big question is how to achieve that. The solutions are not going to be easy and the changes will not come quickly. There are many things needed to improve diversity in Hollywood. I teach at a film school where applicants from American students trend overwhelmingly white and male. I suspect this is true at most film schools. Academic institutions need to make an effort not just to bring in diverse students, but to support them with scholarships and job placement. And many colleges, including mine, are doing just that. I also think the industry needs some more diverse role models to inspire minority kids to look to film as a viable dream. But ultimately the only change that will really transform the business needs to come within the ranks of the executives who choose what films get made. And these executives are overwhelmingly white and male. According to the Bunch Report on Diversity in Hollywood, film CEOs are 94% white (and 100% male). Senior management at studios is 92% white (and 83% male). Unit heads at studios are 96% white (and 61% male). When we talk about movies not reflecting the world around us, we should understand that for these executives, all-white casts DO reflect the world around them! Of course it’s not as easy as simply plugging minorities into executive jobs. Those jobs are complicated and challenging and rely a lot on talent relationships. The only way to be successful is to work your way up through the ranks, building knowledge, experience, and relationships along the way. So it’s important to have strong programs to recruit diverse talent into entry-level studio positions, but it’s probably going to take years before meaningful change hits the executive levels. Hopefully, though, if current executives are surrounded by more diverse employees, the executives’ world view will expand accordingly. What’s particularly annoying about all this is that all evidence points to diversity in casting being good for the business. According to the Bunch Report, 51% of frequent moviegoers are minorities. And many of the box office hits from last year – movies like “Straight Outta Compton,” “Furious 7,” and “Star Wars: The Force Awakens” – show that diverse casts won’t hold a good movie back. But Hollywood is a place ruled by fear. Executive turnover is high and there are many uncontrollable variables to success. Risk taking is not rewarded. So executives rely on “conventional wisdom” that is decades old. Conventional wisdom like: women will go see a movie with a male lead, but men won’t go see a movie with a female lead – a piece of “wisdom” blown out of the water by The Hunger Games movies, yet still clung to by many executives because it’s safer than suggesting a new way of thinking. What will it take to break executives out of their entrenched misconceptions? That’s a good question. I don’t know if I have a good answer. I am not an Academy member and don’t vote for the Oscars. I do vote for the WGA Awards and Spirit Awards. Over the holidays, I watched several screeners with my family. My Mom asked me how I judged screenplays. I said I considered many things – my enjoyment of the movie, the craft elements like structure and dialogue, how much the scripting contributed to the movie’s success, and the degree of difficulty the screenwriter faced from the subject matter. In the future, I think I will also pay more attention to how well the film reflects the reality of the world it portrays. This doesn’t mean I’ll reject a film with all white characters – if you’re doing a story about the 15th century British monarchy, naturally all of the characters will be white. But if I’m watching a movie set in a contemporary American city and all the characters are white men, well, that’s just not good writing. EDITED: In my initial post I had overlooked Christian Bale's supporting actor nomination from "The Big Short." I corrected that above. Check out my brand new book: The Three Stages of Screenwriting. Hello, dear LetsSchmooze readers. I alerted you it would be coming a few weeks ago, and now it’s here. My book on screenwriting, The Three Stages of Screenwriting is now available in print (from Amazon) and ebook (from Smashwords). More retailers should be carrying it shortly. I have spent more than two years working on this book, and I’m very proud of it. If you’d like to read an excerpt of the book, one is available here. If you’d like to find out more about the book, please visit the ScreenMaster Books website. Stage One – Developing the Story covers choosing a viable feature film idea, developing that idea into the best version, structuring the plot, developing the characters, crafting a step outline, and using various narrative devices. Stage Two – Writing the First Draft covers scene construction, writing action and description, writing dialogue, the opening of the script, maintaining forward momentum, and using suspense, surprise, mystery. Stage Three – Rewriting covers techniques for structural revisions, techniques for character revisions, troubleshooting tips for common problems, revising scenes, and polishing. I hope you’ll consider giving it a look. And if you have any thoughts or questions, feel free to drop me a line here. I’ll likely cover some of them in a “Mailbag” post in a few weeks. I need to thank several people who gave me feedback and suggestions on The Three Stages of Screenwriting: Cindy Davis, Paul Guay, Ken Aguado, Pavan Ojha, Bill Gladstone, Lisa Kors, Robert Watson, and Kat Smith. They helped me improve it immeasurably. I also want to say thank you at this point for all of you who have offered kind words, questions, or suggestions about this blog. It’s very gratifying to hear how useful people find it. I hope you'll forgive me that this week's post is a little short (and self-serving!) I've been rather busy with the book release, as you might imagine. Over the next few weeks, I plan to do two or three posts about how I broke into the industry, how I sold the Sweet Home Alabama spec screenplay, and maybe some of my experiences seeing the film made. I'm also considering doing a series of analyses of the WGA's top 10 screenplay list (two of which – The Godfather and Some Like It Hot I use as examples in the book). It’s time for my list of the twelve best-written movies of last year! Yes, normally I do ten, but I was having a really hard time narrowing down my top twelve, so I decided to just include them all. Keep in mind, this is a list of the best written movies, not necessarily the best movies or my favorite movies. This year provides a great example of this principle: Mad Max: Fury Road (written by George Miller and Brendan McCarthy and Nico Lathouris), which was one of my top three favorite movies of the year but didn’t make this list. It’s not that Mad Max: Fury Road wasn’t “written” as some of the press has suggested. It may not have had a traditionally formatted screenplay, but there was a plot, dialogue, and distinct scenes that were written down in some form. And those elements were all competently done. However, they were not the reason the movie was such a wonderful experience. This was not a movie driven by the screenplay. My other usual disclaimers apply: I see a lot of movies, but I haven’t seen everything. I haven’t yet seen The Revenant or Room, though I very much want to and expect them to be good. And I may in the future discover other movies from 2015 that would bump some of my selections off the list. Also, some movies age better than others, and because many of these are awards season movies, I’ve seen most of them pretty recently. My opinions could cool over time. Looking back at last year’s list, all the movies hold up pretty well, though I would probably move Whiplash higher on the list. And though I’m happy to hear your opinions in the comments, this is my list. If you don’t like it, you’re welcome to make your own! 1. Ex Machina (written by Alex Garland) – This is an amazing achievement. A tense, entertaining and thought provoking thriller with only four characters and a single house as a location. The writing is incredibly smart with great twists. The characters are particularly complex and interesting. This is easily the best-written movie of the year in my opinion. 2. Sicario (written by Taylor Sheridan) – Impressive on several fronts. First, the plot is genuinely unpredictable, creating tremendous tension. The characters are interesting and dimensional. The dialogue crackles with voice and subtext. There’s great scene work and masterful suspense. And it’s all elevated by the thematic depth and complexity of the story. 3. Spotlight (written by Josh Singer & Tom McCarthy) – The movie and the screenplay aren’t flashy, but they’re so absorbing I felt like I didn’t want the film to end. The characters and characterizations are particularly strong. And parts of the story were challenging to dramatize – much of the investigation involved research in books and files. Kudos to the writers for finding ways to keep things tense and compelling. 4. The Hateful Eight (written by Quentin Tarantino) – He may not be to everyone’s taste, but it’s hard to argue that Tarantino isn’t one of the most original writers working today. This film has his usual vivid dialogue and interesting characters, and also avoids some of the traps he tends to fall into by sticking with a fairly straightforward plot. And it feels like a movie event, something you don’t get to see every day, something worth leaving the house to go to the theater. 5. Bridge of Spies (written by Matt Charman and Ethan & Joel Coen) – This is an excellently crafted screenplay. The characters are well drawn; the scenes are interesting; the plot is tense. The writers find great opportunities for humor and thematic pondering without slowing down the action. Plus, the bifurcated nature of the story made this screenplay a challenge – one the writers overcame quite nicely. My only quibble is that it felt just a bit too long. 6. Shaun the Sheep Movie (written by Mark Burton & Richard Starzak from characters created by Nick Park) – This movie is a pure delight. There’s so much warmth and clever humor here, and with very little dialogue. They make it look easy… it’s not. 7. Trainwreck (written by Amy Schumer) – I don’t know if I’ve ever seen someone use the tropes and clichés of a genre so effectively to tell a specific, personal story. It achieves a difficult balance between humor (sometimes to the point of silliness) and grief, loss and love. The characters feel like real people and that makes all the clichés emotionally effective. 8. Star Wars: The Force Awakens (written by Lawrence Kasdan & J.J. Abrams and Michael Arndt based on character created by George Lucas) – This is a tough one for me to rank because Star Wars has such an outsized importance in my life and the franchise carries such enormous baggage for the writers to deal with. I think they did an admirable job capturing the spirit of Star Wars and managed to tell an entertaining story with some new great characters. Yes, it may be a little derivative of earlier Star Wars movies, but that was probably the only way to successfully restart the film series. Could it have been better? Probably. Was it a great time at the theater? Absolutely. 9. Steve Jobs (screenplay by Aaron Sorkin) – I will admit I didn’t expect to like the film. Not only had I heard negative reviews, I had ethical qualms about the liberties taken with the facts of Steve Jobs’ life. But as it turned out, this screenplay is pretty great. Sorkin writes excellent dialogue for smart people, and all of these characters are very smart. He also managed to give all the characters in this screenplay unique voices, something Sorkin is not usually known for. And he does a fantastic job here, as always, finding ways to dramatize internal thought processes and character perspectives. The movie packs surprising tension and a solid emotional punch. 10. The Big Short (screenplay by Charles Randolph and Adam McKay) – I didn’t love this movie quite as much as the critics, but it is a surprisingly entertaining film about a pretty boring (but important) subject. The writers achieved this by creating interesting and unusual characters and with some clever breaking of the fourth wall. An impressive achievement considering the degree of difficulty. 11. The Martian (screenplay by Drew Goddard) – This is an excellent screenplay from challenging material. Not only is much of the story about a single character by himself, the conflict is of a scientific/intellectual nature. Goddard found a way to make this all visual, and also managed to capture much of the humor from the book. My complaints were mostly related to the ending, which strained the hard-won scientific credibility of the rest of the movie. 12. Straight Outta Compton (story by S. Leigh Savidge & Alan Wenkus and Andrea Berloff, screenplay by Jonathan Herman and Andrea Berloff) – There were probably three movies worth of material in this screenplay, which is an impressive feat but also resulted in a film that felt a little overstuffed and overlong. Still, it was very entertaining with well-drawn characters and an interesting and well-dramatized social commentary aspect. Not your typical music biopic – and that's a good thing. I also want to give honorable mentions to Spy (written by Paul Feig) and Mission: Impossible – Rogue Nation (story by Christopher McQuarrie and Drew Pearce, screenplay by Christopher McQuarrie) as two movies that were much better than expected thanks to some excellent scripting. Both were strong candidates for this list. I also typically pick a movie as worst-written every year. I don't actually mean the worst screenplay, but rather a movie that should have been much better written than it was. This year the (dis)honor goes to San Andreas (story by Andre Fabrizio & Jeremy Passmore, screenplay by Carlton Cuse). The movie is rife with implausible, cardboard characters, ridiculously clichéd dialogue, and wildly unbelievable plotting. There is some enjoyment to be had from the visual effects spectacle and attractive casting, but none of that comes from the screenplay. 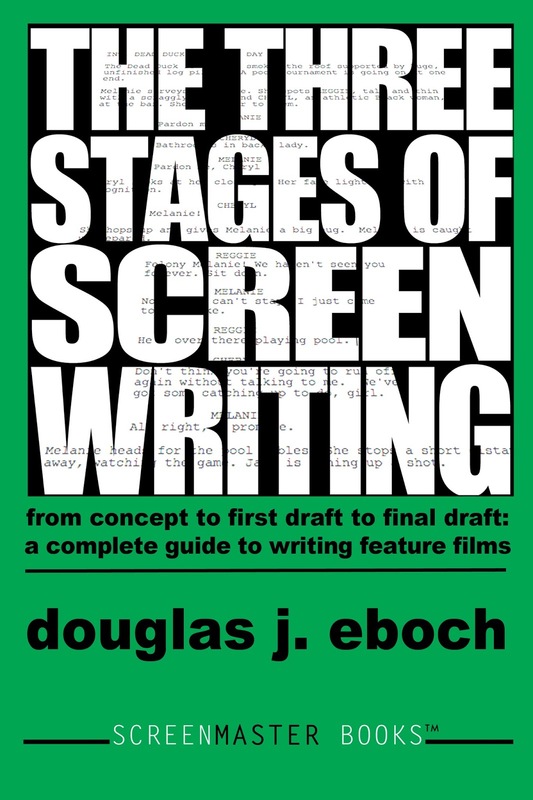 It's coming soon... my book on screenwriting, The Three Stages of Screenwriting. The film business is in a period of fast and radical change. I want to kick off 2016 by looking at some trends that have been developing in Hollywood that effect screenwriters. 1. Simultaneous Development. With so much at stake on big franchise movies, recently some studios have begun hiring multiple writers to work on screenplays at the same time. These writers are not working together, they are each writing an individual script. The studio will then decide which it likes best (and probably cannibalize good ideas from the others). It seems to me this is the evolution of the “pitch off” when multiple writers are brought in to pitch their take on a piece of intellectual property, although with simultaneous development, at least every writer gets paid. This has been done on the upcoming Wonder Woman, Aquaman, and the 21 Jump Street spinoff. 2. Shared Universes. It's no secret studios love franchises. Successful franchises like The Fast and the Furious series, Hunger Games series, or Harry Potter series can keep studios financially sound for years. The new trend is franchises built around shared universes – story worlds that can support films about multiple characters and stories, thus creating a "brand" that draws audiences even when the movies are not traditional sequels. Marvel kicked off the trend with their shared universe of superheroes. Star Wars has had a shared universe of ancillary products (books, video games, animated shows, etc. ), and Disney is now applying the idea to the Star Wars movies with standalone films like the upcoming Rogue One and Han Solo origin movie. Warner Brothers is trying to turn the world of Harry Potter into a shared universe with Fantastic Beasts and Where to Find Them. And Universal is attempting to create a shared universe around their classic monsters, while Sony is working on a Robin Hood shared universe. It seems this is the future of a lot of screenwriting jobs, so effectively playing in someone else's sandbox will be a useful skill to hone. 3. Feature Writers’ Rooms. This is related to the “shared universe” trend. With studios making multiple movies set in the same world, the feature films occasionally resemble television series – coming this summer, episode twelve of Marvel’s superheroes! And the feature world has started borrowing another television practice: writers’ rooms. Teams of writers have been formed to shepherd the development of stories in the Transformers world, Star Wars world, and the upcoming series of movies featuring Universal’s monsters. The teams develop stories and treatments for various films in the franchise that are then handed off to writers to turn into the individual screenplay. Savvy writers will be keeping an eye on how these trends develop. 1. Three Traps to Avoid in Love Stories. 2. My Interview with Khalil Sullins. 3. Seven Questions for Better Scenes. 4. How to Know if Your Idea is Marketable. And, since that last one is maybe not the most useful, in sixth place was 5 Questions About Your Story to Answer Before You Start Writing - also, I think, one of my best posts. I'll plan to have my 10 Best Written Films of 2015 list next week!